Michelle Moreno is a camera coach. She works with entrepreneurs, creators and anyone who wants to get in front of the camera. She helps them show up, present and crush their video presentations. As an actress, singer, business writer, confidence expert, Michele helps you to become a better version of yourself and turn your viewers into CLIENTS. 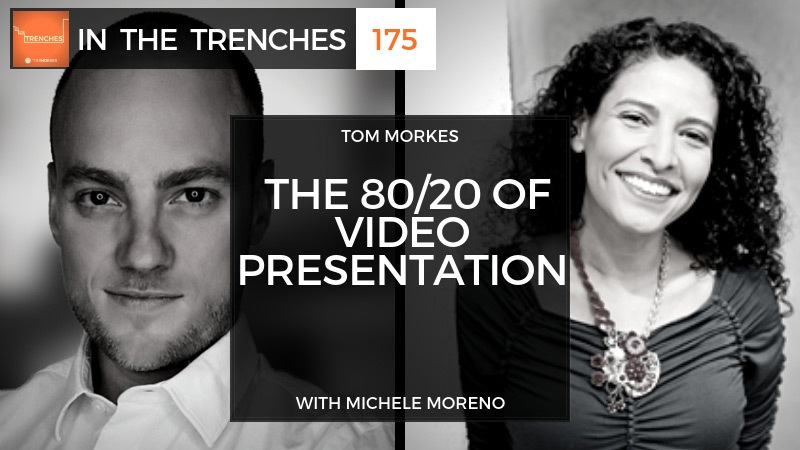 we specifically talk about 80/20 video presentations. What are the 20 percent of things that are the most critical, that will get you 80 percent of your results when it comes to presentation and being on camera? My big takeaway is that the 20 percent that creates the 80 percent of the results is all stuff that’s under your control and it has nothing to do with big budget editing or anything like that. This applies to anybody who wants to start live streaming and anybody who is on YouTube or Facebook live, or do any other kind of video production. The critical pieces are the things that you do when you’re on camera and how you show up, speak, look, and engage. That is what we cover in today’s conversation. Make sure face is large in the frame. Top of head to top of the frame – close the gap.